The basic function is to show last known positions of tracking devices over a live map, including route and/or race specific information and analysis. Individual CT Users are represented by icons on the map. Click on the icons for more information on that CT User. A sidebar gives a list of all CT Users with zoom controls and links to individual tracking history pages. A public tracking map for the Colorado Trail, following thru-hiker progress on the trail by season. The Colorado Trail is an 486 mile backcountry trail that runs from Denver to Durango. 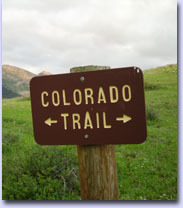 This tracker is provided for any and all users of the Colorado Trail that wish to be tracked here. Whether section hiking or going the whole enchilada on a bikepacking trip, join the CT community and let others follow your journey. All you need is a SPOT tracking unit. For more info or to get set up on the tracker, Contact us.